We were kickin' it old school with a paper notebook sign in to our school counseling office until October of this past school year. We thought... what an easy opportunity to collect some data! We teamed up with our school's tech dude to set up a Chrome book with a sign in page (created on Google Forms). 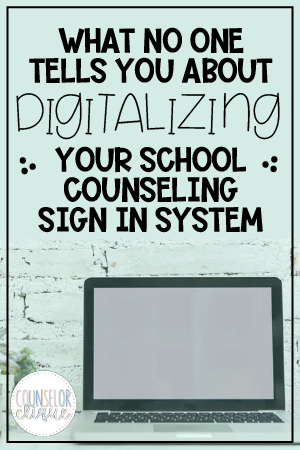 We also would bookmark things we had going on that week, so parents and students could access more readily: ASVAB sign ups, small group sign ups, our main school counseling webpage, transcript request page. Seeing the results to our data collection was my favorite part. The most eye opening piece of information was the 81% of people who did NOT have an appointment when they came in. What does this mean for counselors? It means our time shifts heavily to responsive services. We drop what we're doing to handle students from the most minute concern to the utmost crisis. Check out the rest of our data collection in this Piktochart I made! Do you have a digital sign in system? What questions do you ask? 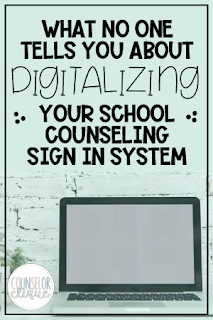 Has your data revealed anything that has special implications to your counselors?